Benzer Testimony Gets Interesting! - Neighbors at War! 3 Comments on Benzer Testimony Gets Interesting! Guns? Organized crime? Fear of winding up in the desert? Major law firms involved? The HOA racketeering trial in Nevada is producing some interesting testimony from witnesses in the scheme to takeover Homeowners Associations across the valley. This trial continues to be a travesty because 37 of the criminals involved were allowed to plead guilty in order to get lighter sentences. The sentences won’t be announced until after the current trial is over. But I’ll take a reporter’s wild guess that the average sentence for these mobsters won’t be greater than 18 months, with much of that time off for good behavior. This is the one instance where I’d be all in favor of debtors’ prisons. Keep these animals locked up until every Nevada homeowner is made whole. I know there are some FBI people who read this blog. Have some guts and start investigating racketeering in HOAs all over the country! HOA Boards all over South Florida are run by thieves. In our news weekly reports are published. Nobody ever goes to jail. It is hard to get the police or district attorney to even listen to your case as we found out in our own neighborhood. Our Board president had three of his children on the payroll with non existant jobs, took kickbacks from vendors, had vendors include his personal landscaping in their bids and paid through the association. This went on for 18 years until I stepped in and examined the books. I have since discovered thst this type of crime is rampant and hardly prosecuted. 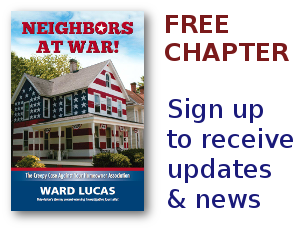 There are no laws governing homeowner associations. It is disgusting. HOAs are a thieves paradise!